‘We are Khoi Warriors’: this course will provide a historical background to the rise of the KhoiSan revivalist movement in South Africa today. It does so by engaging critically with ideas around indigenous KhoiSan identity, precolonial, colonial and decolonial knowledge or ‘ways of knowing’. The course will also explore the implications of these ideas for campaigns for social justice. Adhikari, M., 2010. ‘A total extinction confidently hoped for: The destruction of Cape San society under Dutch colonial rule, 1700–1795’. Journal of genocide research, 12(1-2), pp.19-44. Soudien, C., 2010. ‘What to Teach the Natives’: A Historiography of the Curriculum Dilemma in South Africa. In Curriculum Studies in South Africa (pp. 19-49). Palgrave Macmillan, New York. Worden, N., 2010. After race and class: Recent trends in the historiography of early colonial Cape society. South African Historical Journal, 62(3), pp.589-602. Verbuyst, R., 2016. Claiming Cape Town: towards a symbolic interpretation of Khoisan activism and land claims. Anthropology Southern Africa, 39(2), pp.83-96. June Bam-Hutchison is a Visiting Professor at Stanford University where she directs a course on their overseas programme ‘Sites of Memory’. She has held Research Fellowships at York University (Institute for the Public Understanding of the Past) and Kingston University for a number of years. 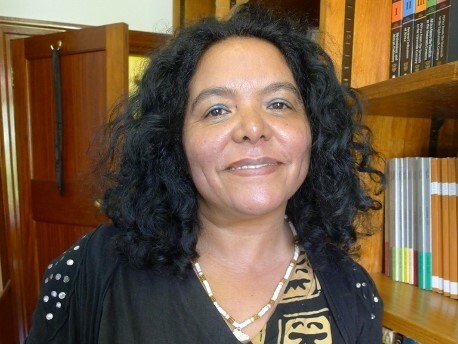 She has lectured at UWC and also recently at UCT, where she held the position of Acting Head of African Studies. She has also worked widely in museums and heritage globally and within the African Diaspora academic networks.